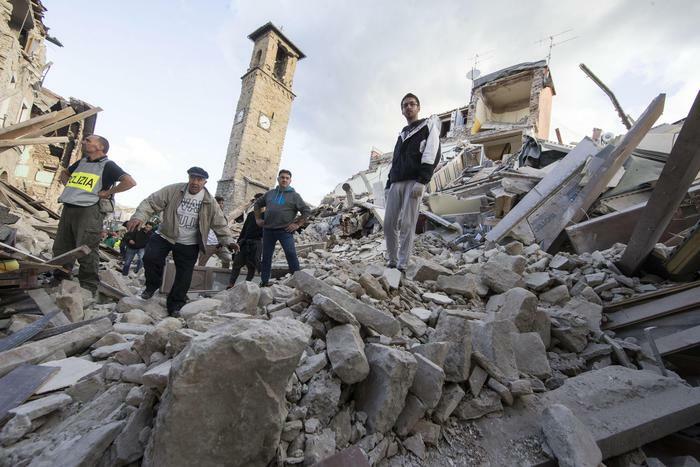 At 3:35am on August 24th 2016, Amatrice was a typical Italian town with medieval churches, narrow streets, and a 13th century clock tower. 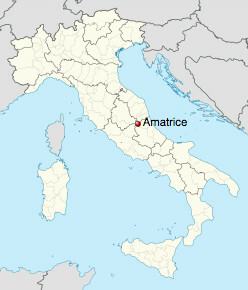 Amy and I had passed through Amatrice the previous year on a bicycle trip. Boys had played football behind the clock tower, next to a jewellery store whose owner had advised us on local hiking trails. We had bought gelato nearby and walked down a main street that had been bustling for centuries. 3:35am on August 24th 2016 was the last time Amatrice looked like this. At 3:36am, a magnitude-6.2 earthquake struck the town. 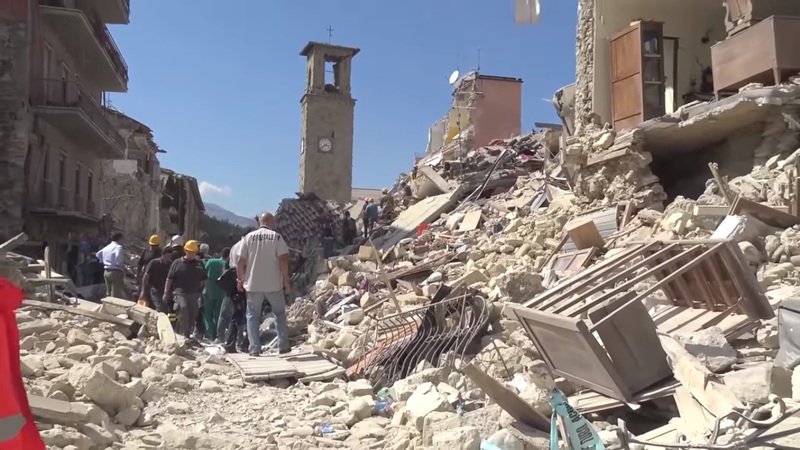 Within seconds, Amatrice was rubble. The ground began to tremble. Within a moment, the walls succumbed to violent seizures. My wife screamed, instructing me to evacuate the building as quickly as possible. I didn’t know what was happening. All I heard was terremoto, terremoto – “earthquake, earthquake” – accompanied by a low rumble and the sound of glass clinging, the floor shaking beneath me. What felt like minutes but amounted to seconds later, we were out of the building, dogs barking and house alarms piercing an otherwise silent night. My father-in-law looked over to me. “This isn’t going to be good,” he said. 299 people were killed, over 400 injured. What became of those boys in the square or the jewellery store owner? Many lives were forever changed that day; some tragically cut short, others lived on. Will an Amatrice as beautiful as the town that fell rise again? The story of another devastated town nearby suggests a likely possibility, one that speaks volumes about how able we are today to build places of quality that nurture happy and prosperous people. 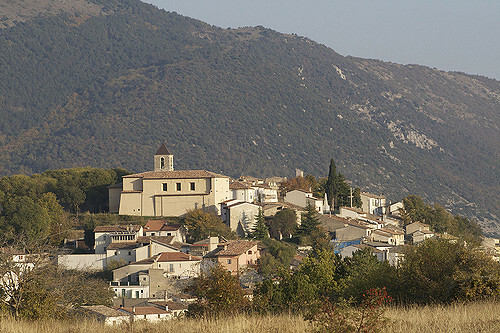 30 miles southeast of Amatrice, Castelnuovo was once a bustling medieval village. Like many of Italy’s old towns, Castelnuovo sat upon a hill with a church at its crest, looking down upon the town. The main street, 20 feet wide, curved gently as it wound uphill. The modest houses fit together like jigsaw puzzles. The above photos are some of the last ever taken of Castelnuovo as it was. 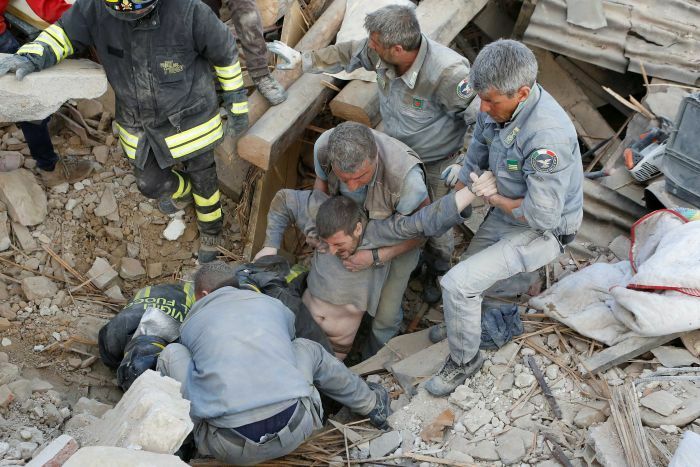 At 3:32am on April 6th 2009 history repeated and a familiar wave of destruction hit: A magnitude-6.3 earthquake, Italy’s worst in 30 years. Just like what would become of Amatrice 7 years later, Castelnuovo’s destiny changed in an instant. By the time Amy and I got there in 2015, the town had stood quiet for 6 years behind locked gates. Eager to explore, we pushed through the gates. The reality of what had happened immediately hit us: the lives lost, a community scattered, a place of character destroyed. The sadness in our hearts grew as we walked silently through the empty ruins of Castelnuovo, the town dead but its ghosts very much alive. We reached the top of the town where only a tiled floor and a single wall stood as evidence of the local church. Looking down past the town, we noticed a small settlement in the distance. This was where the residents had been moved after the earthquake. They were surely expecting these to be temporary digs while Castelnuovo was rehabilitated. 6 years later, not a thing had changed, with no end in sight. The old Castelnuovo belonged to a world made by hand at the human scale by local people, using local materials, in the local style. These people weren’t geniuses, they didn’t take architecture degrees, and they didn’t have bureaucracies and developers to do things for them. Instead, they inherited generations of knowledge about what worked. Their resources were limited to the local scale and, reflecting our own modest limitations as human beings, this meant places perfectly and beautifully adapted to human bodies and hearts, places they could walk around, be with other people, and repair and maintain themselves. When Castelnuovo’s survivors moved from their ruined town to its replacement downhill, they belatedly entered the industrial era: Identical homes created by absent authorities and distant developers, made of flat-packed mass-produced components from faraway factories, proportioned and separated with geometric rigidity. This is the same system that is rebuilding the places where you and I live, in our downtowns and our neighborhoods. 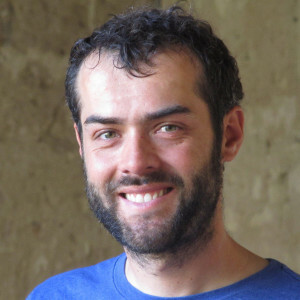 The fate of the people of Castelnuovo – and probably Amatrice – is a testament to the unintended consequences of the industrial system of production, which has made us gods of efficiency but paupers of quality. We mechanically churn out places at an unbelievable rate, but we cannot hope to recapture the charm of the Castelnuovos and Amatrices. These old towns touched our hearts not because, as is commonly claimed, they are old but because they reflect our true natures as creatures of the earth. As the landscape changes before our eyes, the question has never been more pressing: Can we reclaim our ability to make places of quality and character – not just single buildings but entire neighborhoods and towns? There is every reason to be pessimistic. The local artisan way of life that produced the world’s greatest places is gone, legislated and lobbied out of existence. Nonetheless, we must push back against the status quo and form a new system that creates places of character that stand the test of time. Everyone needs to play their part. Communities can provide guidance on context-sensitive design and adopt a positive role, shedding the all-too-common NIMBYist tendencies; architects can work more closely with communities and become design stewards and facilitators, rather than working in abstraction; governments can create a framework that unites everyone around a core set of values, rather than keeping communities and architects/developers in isolation and at loggerheads. This can and must be done. We are still capable of beauty, but first we must pause and think carefully about how to do it. Something stands out, literally and figuratively, among the rubble of Amatrice. One building survived. Tellingly, it was the oldest in town: The 13th century clock tower. We all take so much for granted. In the blink of an eye, natural disasters can–and do–change our lives forever. 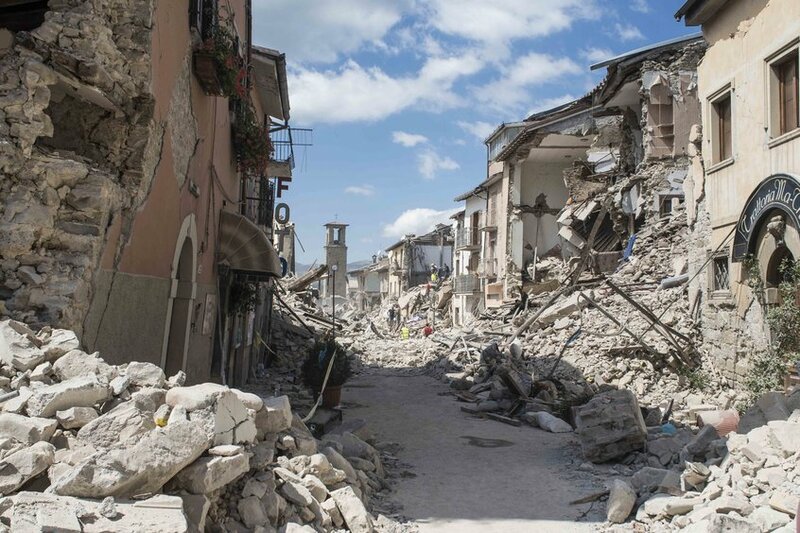 So sorry for the people in the towns in Italy that you and Amy visited–and all nations, including ours, that are never able to completely recover from the massive devastation.